Rob Refsnyder understood early on where he stood in the New York Yankees organization. He was an extra player, someone they could call up to fill a roster spot during an injury. Someone to plump up their Triple-A roster in Scranton/Wilkes-Barre. His true major league opportunity was unlikely to come with the Yankees, who drafted him during his junior year at Arizona in the fifth round of the 2012 draft. So when he was traded to the Toronto Blue Jays organization for first baseman Ryan McBroom earlier this week, it was a chance for the 26-year-old to turn the page. New colors. New team. Fresh start. 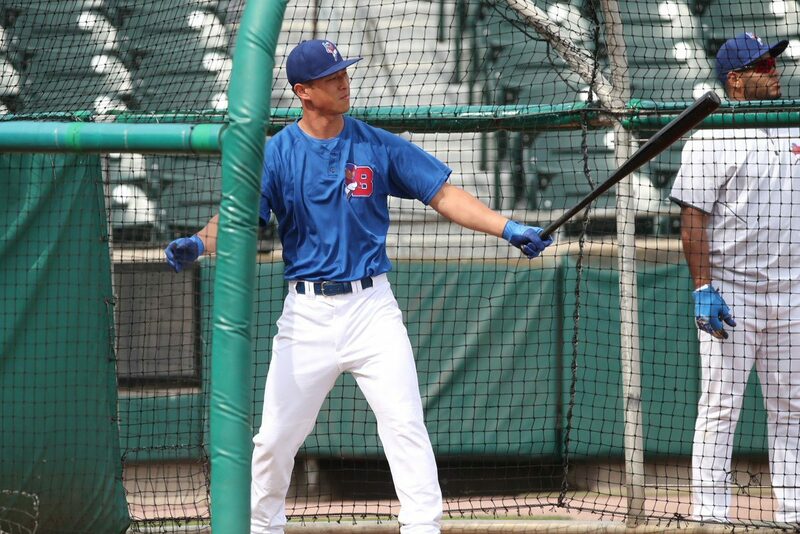 That's how Refsnyder is looking at his new opportunity with the Buffalo Bisons. "It's my last option year so I mean that's the luxury for teams having younger players, they're able to option guys up and down," said Refsnyder who made his Bisons debut on Tuesday as the designated hitter. "There's a lot of contracts with the Yankees and a lot of players playing really well, so I was more of an insurance policy for them." Refsnyder made his MLB debut in 2015, playing 16 games for the Yankees. Last year he split his season between Scranton and New York, but this year the organization placed him at first base -- the first time he played at the position in his five-year pro baseball career. "In my situation I knew I was an insurance policy. I mean, I had never played first base last year and they threw me at first base," Refsnyder said. "I definitely knew I was an insurance policy and if somebody got hurt I would go up and kinda just fill a bench spot for a couple days or whatever it was. Never knew what position I was going to play. So it's refreshing to come here and get a new start and I'm looking forward to it." In Buffalo, he is expected to play second base. It's a position he's used to, although Refsnyder noted he's most comfortable wherever he gets the most game repetitions. Baseball is about reps and consistency, which has kept him at times from finding a groove. "We're hoping to get him comfortable at second," Bisons manager Bobby Meacham said. "I want to see him just get some comfort level out there so he can relax. I always like to say to the infielders, 'when you're playing out there I want you to get comfortable so you can just worry about hitting.' That's kind of what I'm thinking -- making him feel comfortable at second, give him some time out there and then just worry about getting his hitting right." His hitting has been good. In 38 games with Scranton he averaged .312, driving in 12 runs with 11 doubles and two home runs. He batted .135 in 20 games with the Yankees, but made only 37 plate appearances. In his first game with the Herd, he went 1 for 3. The numbers are one thing. But a fresh start with a new organization also gives a player like Refsnyder a chance to make a new first impression. "People watch you and they watch and they form opinions," Meacham said. "That's what they think of you and it's hard to shake whatever that first image is, really. He's got a shot to start out fresh and get people to look at him who haven't seen him up close before."